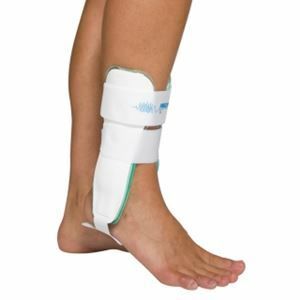 Aircast Sport-Stirrup ankle brace (Ankle Injury),A brace for preventing ankle injuries and its narrow design provides comfort while wearing it in your shoes. A brace for preventing ankle injuries and its narrow design provides comfort while wearing it in your shoes. Aircast Sport Stirrup by DJO Canada is design to prevent ankle injuries. It is narrowly designed for more comfort in a shoe. Its anatomically designed shells provide inversion and eversion. Features pre-inflated aircells to make it fit easily. When you put on, it also prevents ankle sprains. This Brace can be worn in your shoe. I got this product as I play football very frequently. It just prevents any injury to your leg. Gives support to your leg when you play. It feels comfortable and soft.